1. As in all UK referendums (or referenda), the outcome is non-binding, as sovereignty is said to lie with the UK government. Therefore, the current UK government can simply just call the whole thing off; put an end to the process; and maybe say the referendum was ‘just a bit of a laugh – nothing serious’! 2. The referendum choice was either to “remain in” or “leave” the European Union. If “remain in” had won, well that’s easy to implement: you just do nothing and carry on. But, as Paul Simon said, there are “50 ways to leave your lover”. So what is meant by ‘leave’? Cut all ties and never speak to the EU again, as long as we both shall live? Or leave as the best of pals, and perhaps even with all the old benefits of ‘membership’ of the EU. Or something in between (like Mrs May is trying at the moment). Jacob Viner’s framework for economic integration (The Customs Union Issue, 1950) makes it clear that no man is an island, and there are all possible kinds of possible collaborations between nations: from ‘preferential trading area’ through customs unions/common markets and the like to all-out economic integration. So really “exit” is impossible. There’s no such thing as Brexit. In other words, the referendum was based on a nonsense. 3. Just leave! Send the EU an email saying “We’ve left. Bye”; pay any financial penalties for breaking any contracts with the EU, and perhaps spend the next decade or so trying to re-collaborate with them bit by bit. 4. Abolish all import and export tariffs (there are not many of the latter). The government makes no more than £5 billion a year from tariffs. For a country with a GDP of £1.5 trillion a year, it’s not going to make a big hole in its finances. This would presumably please the Brexiteers, and – as it would likely lead to increased economic activity – it would please Remainers too. Why would it lead to increased economic activity? Ask an A’ level economics student. Their text books should all state that all tariffs restrict trade and are therefore bad (something many current economists seem to have conveniently forgotten). Eliminating tariffs would not benefit all producers, of course, but it would benefit all consumers (i.e. the rest of us); and companies doing business in the UK would know where they stood. It would also put the cat among the pigeons with the EU, which would fear a flood of imports from non-EU countries into the UK, and therefore into the EU via the back door (Ireland). But that’s their problem (or Ireland’s). Anyway, since when has increased trade, growth and wealth actually been a problem. And, as for “so-called” Brexit, the EU would probably then chuck Britain out. Problem solved. The government could then spend the next decade or so trying to re-collaborate with them bit by bit. 5.The final answer may be not actually supply lots of possible alternatives to Brexit (such as those above); otherwise we’ll spend another 2 or 3 years arguing about which of these options is best. Anyway, it’s worth remembering that we so-called Brexiteers and Remainers have much more in common than we realise. We both want to continue trading with Europe, we both want to travel to Europe with a minimum of fuss, re air travel, roaming, etc; we both want a democratic government to look after us (and let’s face it: there’s little difference between EU and UK legislation); and neither of us want to be overwhelmed by immigration either, maybe we’d just disagree about the numbers coming in. So come on, let’s all party together like it’s May 2016. Well, first I guess we should say what we mean by a ‘feminist’. If we mean ‘someone who believes in ‘equal rights and opportunities for both women and men’, then I’m sure it would be hard to find anyone who disagrees with that, so we’d “all be feminists now”! However, if we mean someone who believes in the all-pervasiveness of ‘the patriarchy’ as an instrument created by men to oppress women and to privilege themselves, then these are the ones I consider mistaken; the ones who consider that ‘everything is men’s fault’ and ‘men are bad’. Having said that, it would probably be difficult to find anyone – men included – who don’t believe that society in the past favoured men and belittled women; and ‘soft’ feminists would be those who did not believe that ‘men are bad’ but believe that society still has some way to go before proper equality is established. However, I think we’re all missing something here. While it’s true that many societies consisted of men ‘working’ and women ‘staying at home’, with people – both men and women – thinking that this was ‘as it should be’. Such societies were constructed, however – not to favour men and keep women down – but to protect and provide for the family. We forget that, until the Industrial Revolution, work was generally back-breaking, difficult, dangerous and bad enough for men to be doing, never mind women. So society, over 100,000 years, generally developed along the lines were men went out and did the hard labour and women stayed home and looked after the family. A classic division of labour: with one half bringing in resources and the other half using those resources to care for the family: a veritable partnership! And it has been only very recently – the last 150 years or so – that this arrangement has begun to change. As society got richer; medicine improved; technology improved; towns grew and rural economies dwindled; with the tertiary economy of services growing at the expense of agriculture and now, to some extent, even manufacturing. Suddenly, women can now do the same jobs (more or less) as men. So it simply is not true that women were suppressed so that men could be all-powerful. Women were actually protected by men! Instead of having to work in the fields with a baby strapped to their backs, they could stay home and care for their families! While it was men who took all the risks and – literally – did all the hard work. Hard work that a woman simply could not do! Therefore, the basic feminist premise of the ‘patriarchy’ is an illusion. Men generally don’t do better out of this arrangement. Men commit suicide more than women, have shorter lives, are more likely to be victims of violence than women (in fact, children are also more likely more likely to be victims than women). So while some non-western societies (without the technological changes and advanced economies that western countries have) may be a little slow to get used to these new changes and may be reluctant – or perhaps less able – to let women take as full a role as they would like (e.g. in Saudi Arabia), I think most western societies have accepted that women may now enter the workforce on a par with men. Ah, but what about pregnancy and looking after the family? Well, that’s another topic but, generally speaking, I’d say that that is for each family to decide for itself. But the salary gap, the salary gap, I hear you say! Well that too is for another day but, let me let you in on another little secret: That too is another myth ! That was the first big mistake they made: calling it Brexit, in or out. Now you have Remainers and Brexiteers slugging it out and tearing the country in two. In fact, if the whole debate had been played out in the context of the “different stages of economic integration”, it may have been a considerably more pleasant affair. As (2), but they decide a single tariff with the rest of the world. As (3) but adding the free movement of services, capital and labour. Steps towards shared fiscal and budgetary policies, legislation, etc, added to (4). The individual countries now have virtually no individual economic control. Britain and the EC are currently around stages 4 and 5, with Remainers at least wanting to maintain this status and some wanting farther integration. The Brexiteers meanwhile want to pare back to stage 2, with maybe some accepting stages 3 or 4. So maybe Brexiteers and Remainers have much more in common than they realise. They both want to continue trading with Europe, they both want to travel to Europe with a minimum of fuss, re air travel, roaming, etc; they both want a so-called democratic government to look after them (and let’s face it: there’s little difference between EU and UK legislation, in general); neither wants to be overwhelmed by immigration either, maybe they’d just disagree about the numbers coming in. 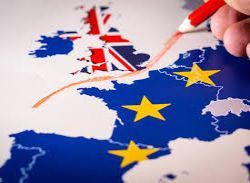 So maybe if we’d looked upon this so-called ‘Brexit’ not as an exit from something, but as somewhere we’d like to be on a sliding scale, the whole process might have been a bit more civilised. To decide national policies most countries, of course, have elections with parties espousing various policies. Some might want a Stage 2 relationship with the EC, others stage 5; well, the normal thing is we have a vote and the party that ‘wins’ gets to decide which stage it wants. If the electorate doesn’t like it, they can try again in the next election a few years later. However, the ex-PM, David Cameron, decided to bypass all of that and call for a referendum on being either “in” or “out” of Europe (as you can see from the stages above, what exactly does in or out mean?). Anyway, the Brexiteers – as if democracy were a basketball match – “won” the referendum 52-48. So did we go back to stage 2 or 3? Eh, no. Not quite. After 2 years of ridiculous bickering, we now have a kind of ‘nothing’ agreement between Theresa May and the EC. Most things will stay the same for now, while more talks to solve everything may go on until 2020 (or longer). The only reasonably sure thing is that – if the sticky NI/Irish border problem doesn’t get sorted -Britain and the EC will fall back to stage 3 – a customs union – but with GB having no input on this to try and improve the terms. So, in other words, no-one’s happy. The Remainers aren’t, because the “agreement” takes them backwards, and the Brexiteers aren’t either, because it doesn’t go far enough back. Well, it’ll never happen in a million years. But probably the first thing the British government could do is remember what every 16-year-old economics student already knows: tariffs are bad ! And remember: tariffs may initially be paid for by companies importing or exporting, but they’re only going to do so if they can sell their goods. In other words, tariffs are ultimately paid for by us, as customers, by increased prices. The Brexiteers talk about negotiating their own trade agreements; Trump talks about it taking years to reach one with Britain. If other countries charge tariffs on British goods being exported to their countries, that’s up to them. Their citizens will be paying those extra costs. OK, that’s not good news for British exporting companies and their staff, but importing companies would benefit. The British government makes £5 billion a year from tariffs. For a country with a GDP of £1.5 trillion a year, it’s not going to make a big hole in its finances. But isn’t it good to have free movement of merchandise, people and capital? Of course it is, and this is what the EU does right. But all of these things can be achieved without paying a central authority (the EU) to manage it. Any country can unilaterally offer all the above right now to whoever it likes – for free. Of course, all of this means governments have less control (and a little less money), and this makes them reluctant to do it. But it’s perfectly possible, and advisable; as the increased flexibility makes everyone richer. Couldn’t we have a second referendum, but better this time? Well, we could have a second referendum, not based on “IN” or “OUT”, but based on the economic integration stages outlined above. So we could ask people, “Which do you prefer: stage 1, 2, 3, 4, or 5?”, for example. However, I suspect the results would be something like Stage 2: 20%, Stage 3: 30%, Stage 4: 30%, Stage 5: 20%. Then, we could whittle it down by taking into account “second choices” or removing the loser from consecutive rounds, etc. But I reckon, in the end, Stage 3 “customs union” might win. And, if it did, I think the best choice for a single tariff with the rest of the world would be ZERO. So we’d be back with my original solution of scrapping all tariffs unilaterally. Ever considered living in a world where you can try and do what you want, without people forcing you to do what they want or taking your stuff? Well, we think it’s possible; and it’s what we promote.